After a small break here is a list of fresh 25 free wordpress themes. Please enjoy. 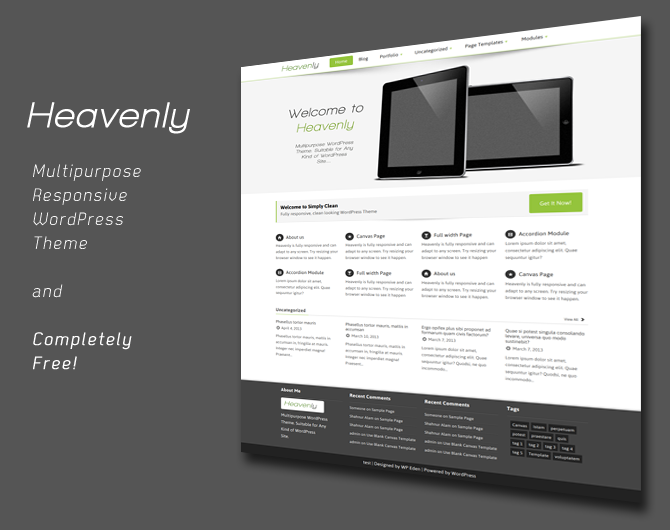 Heavenly is a responsive, customizable, search engine optimized Multi-purpose WordPress Theme which will be perfect for any type of site, built with twitter Bootstrap. Fully Responsive, Clean and multipurpose theme using Twitter Bootstrap. This theme is will make your website adaptable with mobile devices. Theme Features: Custom Homepage Settings, 3 Page Templates, Custom Background Support, Search Engine Friendly. Fully Responsive WordPress Theme using Twitter Bootstrap with Metro Styled Accent. This theme is will make your website adaptable with mobile devices. Theme Features: Custom Homepage Settings, 3 Page Templates, Custom Background Support, Search Engine Friendly. Silverclean is a clean, elegant and responsive premium WordPress Theme. It is based on the powerful Icefit framework, one of the most advanced WordPress theming framework in the world! Create a beautiful and professional looking site in minutes with the revolutionary layout builder, and show it to the world with cross browser support and responsive design (your site will resize and adapt automatically to any device and screen size, from desktop computer down to mobile). This theme is released under the GPLv2 License, and can be used on as many websites as you want from a single download or purchase. The Picus WordPress theme ideal for photo blog, photography sites. This theme comes very special overviews like super easy theme options panel, social media and search engine friendly, custom “skills” and “about me” sections, custom post types, WordPress 3.5 and all modern browsers compatible! Photo Theme Responsive is a WordPress Theme with mobile and tablet responsive design. Free Photo Theme is perfect solution for any professional photographer. Kenny Allan Professional Photographer. 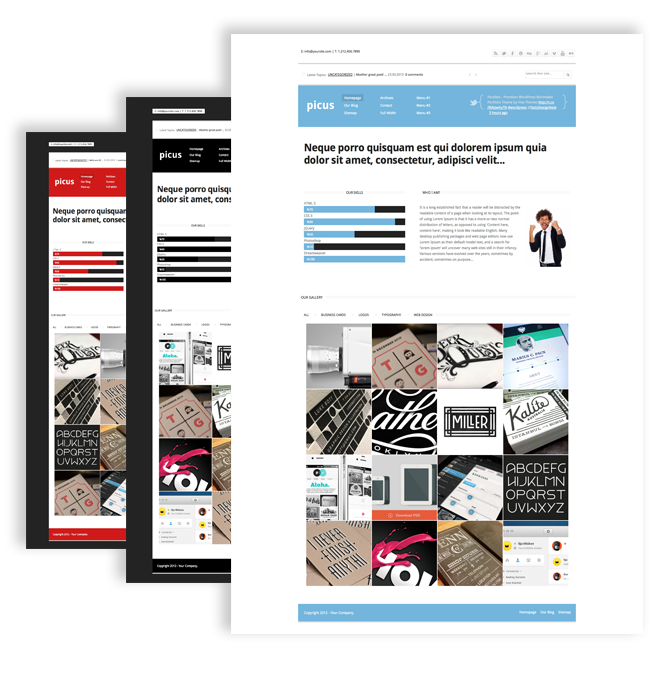 BoldR is a bold, responsive, magazine style premium WordPress Theme. Based on the powerful Icefit framework, one of the most advanced WordPress theming framework in the world, it is perfect for tech or design oriented blogs and creative business websites! Create a beautiful and professional looking site in minutes with the revolutionary layout builder, and show it to the world with cross browser support and responsive design (your site will resize and adapt automatically to any device and screen size, from desktop computer down to mobile). This theme is released under the GPLv3 License, and can be used on as many websites as you want from a single purchase. Eden Fresh is a Clean, Responsive Theme for your WordPress site. This Theme is perfect to build your own portfolio site or a site for any company. Simple, responsive theme, suitable for personal or corporate blog. Simple, responsive, pin-style theme for your personal blog. Frontier is a minimalistic wordpress theme from fabthemes.com. This is a WordPress 3+ ready theme with features like Custom menu, customizable jQuery slider, featured images, widgetized sidebar, customizable banner ads, theme options, etc. Garvan is an exclusive video blogging theme. This theme works relying on a plugin called Featured video plus. This plugins makes it easy to add featured videos to your posts, just like featured images. The video screenshot is automatically generated by the plugin. You add videos from different video sharing sites and also use self hosted videos. iShop is a free ecommerce WordPress theme. This theme uses the cart66 lite plugin to power the ecommerce aspect of the theme. The Cart66 lite is a free WordPress plugin. The theme comes with other features like, custom menu, custom post types, custom taxonomy, featured images, custom homepage, jquery content slider, theme options etc. 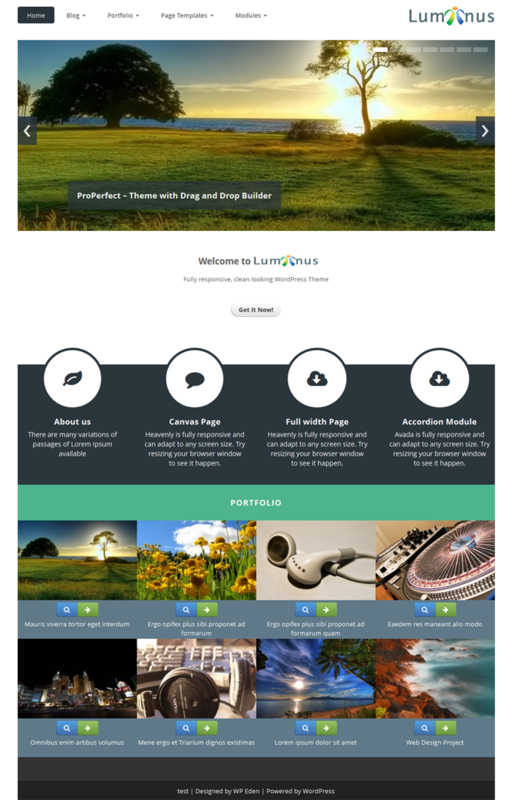 Helix is a free premium WordPress theme. 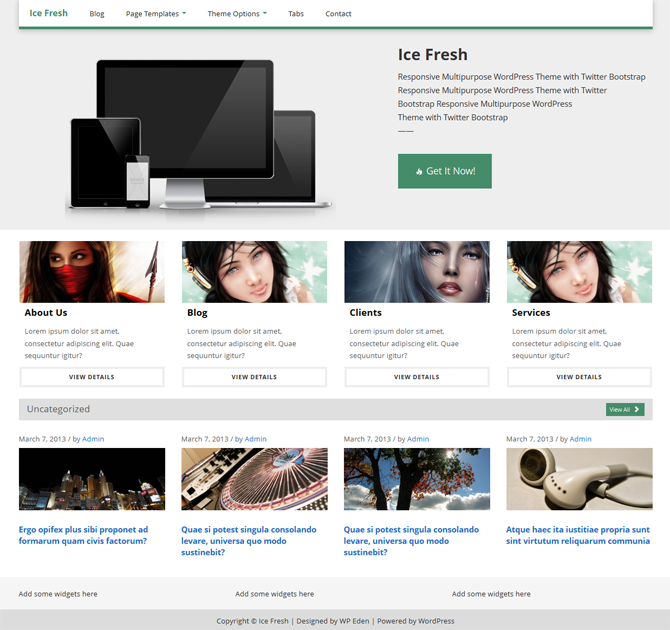 This is a WordPress 3+ ready theme with features like custom menu, fullscreen slideshow homepage, widgetized sidebar etc. Theme also comes with an option panel. 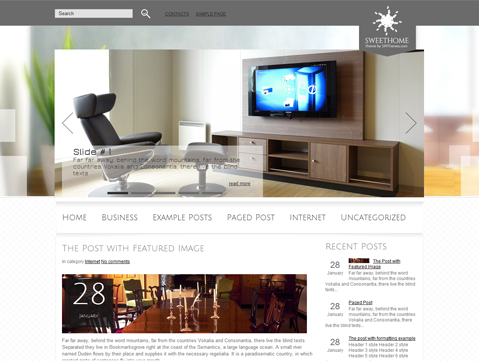 SweetHome is one of the best stylish and clean themes for interior WordPress blog. It has designs which are good-looking. It comes with advanced features allows you to make changes to the theme without code editing. This simple and elegant WordPress template is great solution for cinema blogs. AmpersFilm boasts easy-to-use admin options and many custom widgets. 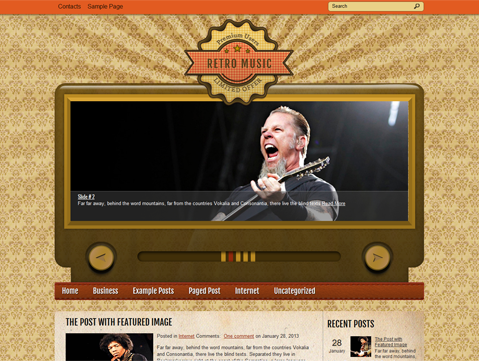 RetroMusic is stylish and clean music theme for WordPress blog. It has designs which are good-looking. It contains powerful functionality that allow you to create amazing music blog. Canonical is a Child Theme built for Responsive. Theme incorporates all Responsive's functionalities and it features clean, modern look. HTML 5 and CSS3 powered KABBO Theme is the right choice for you. Customizable Background and other options will give the WordPress Driven Site an attractive look. KABBO is super elegant and Professional Theme which will expand you widely. 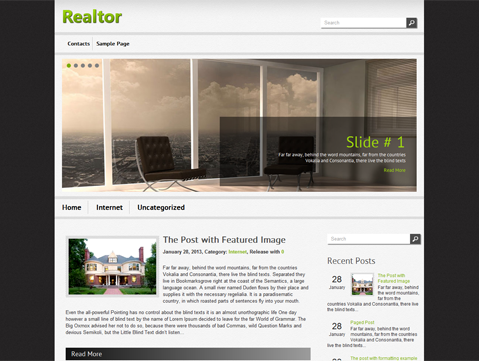 The Slider will show the featured images and contents of posts automatically. WP Opulus is a modern, highly customizable and responsive (mobile-friendly) HTML5 and CSS3 WordPress theme that allows you to change the site's colors, frontpage layout, headers, page templates, fonts, and much more! Take advantage of the portfolio custom post-type to showcase your gallery of work. The responsive layout works with any browser so your website looks great on iPhones, Android phones, tablets and desktops. A very neat and clean orange and white business theme. The theme is fully responsive that looks great on any device. The theme supports widgets. And features theme-options, threaded-comments and multi-level dropdown menu. A simple and neat typography. Uses WordPress custom menu, header image, and background. iMag Mag is a Premium WordPress News Magazine Theme for free.It is Fully Responsive WordPress Theme. It Includes much more options and highly customizable. It is Magazine Style Responsive layout with unlimited sections. You can create many sections by adding magazine homepage widget. It has four column Footer Widgets. You can add unlimted Widgets in each Footer Column. It Offers Widgetized Sidebar. 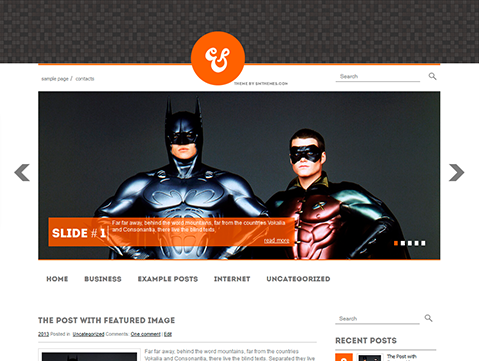 Theme also come with Category Post Widget, Recent Post Widget, Popular Post Widget,Latest Tweets Widget, Flickr Widget. Orbit Theme adapts your website to mobile devices and the desktop. Theme Options with Color Schemes, Front Page for Business, Fonts Options (include Google Fonts), Social Networking, Slider in Front Page, Search Engine Friendly, 6 Widget Areas (3 in Front Page and 3 for Footer), 2 Menu Positions, 2 page templates with its sidebar and W3C Markup Validated.